Most car owners assume that their car batteries will last forever, that’s why many are bewildered when their vehicles fail to start. But here is the truth – no matter how good your car battery is, it isn’t built to last forever. It is highly likely that you will need to replace your 12 volt car battery once throughout your car’s lifetime. However, the better the battery you choose, the longer it will provide you with those ignition moments. No matter the vehicle your drive, there is a battery for you and I will help you to get it. 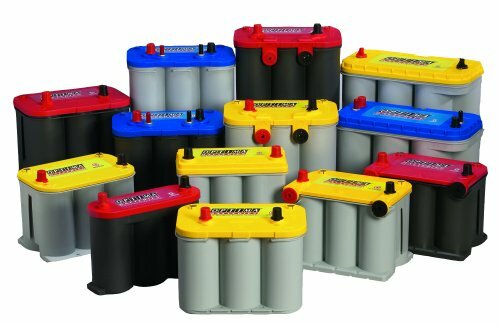 I have been in the battery industry for long and know how to spot the best battery for every car. Here you will get some of the greatest, most popular, and most affordable 12V batteries in the world. To be sure they are 12V batteries, just check the vent; all these batteries have 6 vents. That means every battery voltage totals to 12 volts when fully charged. I understand that the table above has given you some ideas of what every battery involves. But that’s not enough and that’s why I have reviewed these car batteries in details below. 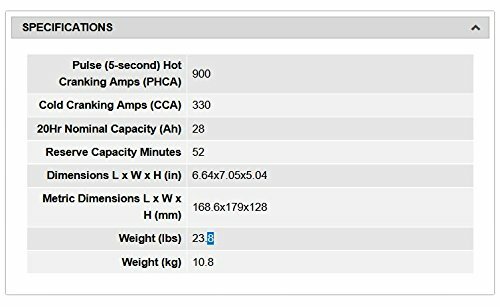 Here is the review of the batteries we have listed in the table above. One thing about the Odyssey PC680 is the ability to take the beating that comes with the terrain. Whether you use it on snow, sea, or land, it remains as good as new due to its rugged construction. Name your terrain and I am certain that this battery will handle it with ease. A nice battery and a great price. What adds to this ability is the fact that the battery is non-spill. So, even if you but it under vibration or shock, you won’t get even a drop of the liquid spilled out. The reason for this is the tightly packed pure lead plates that are made using the AGM design. Moreover, its power cannot be compared to most car batteries out there today. In fact, due to the pure lead plates, you get three times the power of a traditional battery. Hence, you can enjoy up to 400 cycles at just 80 percent depth of the discharge. And if you stay in a salty area, you don’t need to worry about this car battery. It is corrosion-resistant; thanks to the tin-plated brass terminals and a sealed design. As well, it high integrity terminal cover and robust intercell connections prevent any damage and corrosion. Fits perfectly in battery car case. Able to retain power for long. Sometimes the battery comes cracked. Might receive an old model. 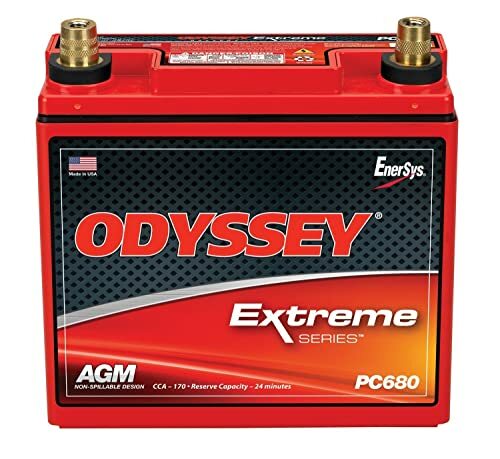 Hand to reach customer reps.
Odyssey PC680 Battery is used for start and run a car or a boat. 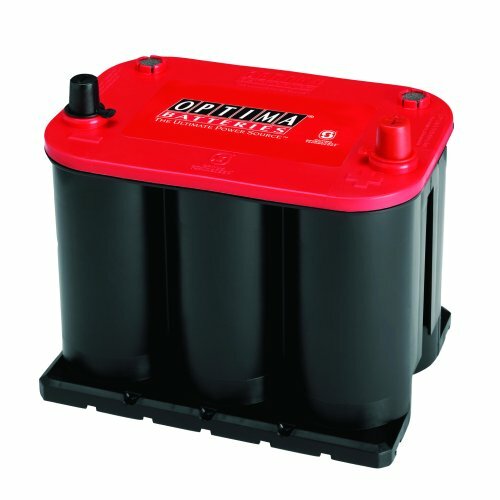 This Optima Batteries 8025-160 RedTop is ideal for off-road use. You can install it in your luxury car, SUV, truck, and hot rod, and take it to any road. The Optima Batteries 8025-160 is a highly rated battery in the line of optima products. Honestly, it’s a high performing battery, maybe because it’s part of the reputable AGM products which provides spiral cell tech. This tech makes other lead-acid batteries look like toys in this industry of vehicle batteries. Optimal igniting power at all temperatures. Strong and powerful 5 seconds ignition burst. To make it simple, I found Optima Batteries 8025-160 to be the best in its class range. I can attribute this argument to the notion that it is great at starting vehicles. Actually, it provides one of the strongest and fastest ignition powers in less than 5 seconds and it starts every time. Besides, my brother owns this battery and I can state that it has outlived his previous model. That’s mean it is a battery that not only outperforms but also outlives traditional batteries in cracking application. From what I have seen, I can say that the Optima Batteries 8025-160 battery is ideal for off-road use. You can install it in your luxury car, SUV, truck, and hot rod, and take it to any road. And you will be amazed to learn that not a single drop of acid will leak out. Free maintenance from the manufacturer. Might die if left idle for long. 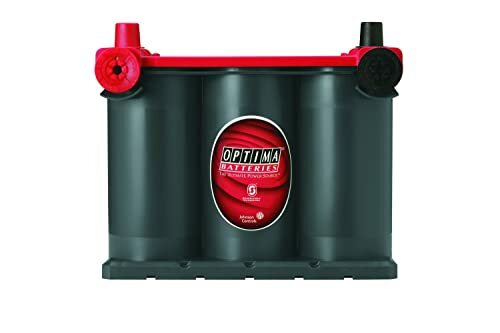 Optima Batteries 8025-160 25 RedTop Starting Battery is mainly used to start a car. This Optima Batteries 8004-003 34/78 has a great burst for starting a car; hence perfect for starting all cars. Another 12v car battery in this list is the Optima Batteries 34/78 RedTop. Just like its brother, the 25 RedTop, this battery provides starting burst within 5 seconds. The battery also lasts longer than a traditional lead-acid battery – great for deep cycle use. Completely sealed to avoid a spill. Easy to mount in any position. I pumped into my neighbor the other day and saw him start his car. When I asked about the battery he uses, he confidently responded Optima Batteries 34/78. The point is his car fired up instantly after he turned the car key. I made it my project that day to research more about this battery and found that it is loaded with tightly coiled pure lead. You all know what this means; an unbeatable output that won’t let you down. In addition, this design comes in handy to allow maximum vibration resistance. Leave the vibration resistance aside, the battery is fully sealed and is 100% maintenance-free. Therefore, no drop dripping arises from the battery when you hit the rough road or turn a full 180-degree. Instant starting of the car. Slow drain kills the battery. Optima Batteries 8004-003 34/78 Battery has a great burst for starting a car; hence perfect for starting all cars. 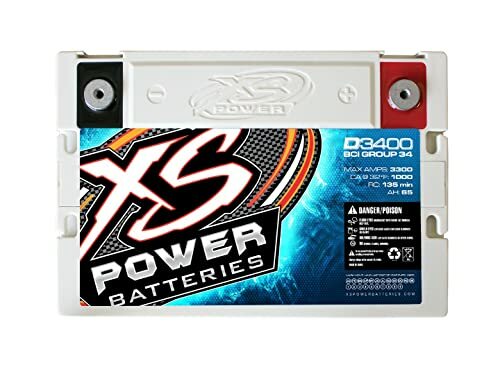 By the time I finish reviewing the SX power D3400, you will notice it is a great 12v car battery. Its overall attributes are astonishing and it provides 12v when wholly charged, not like some batteries which don’t reach that level. The construction is also perfect when compared to some cheap models out there. Runs all electronic devices in a car. One feature that I must inform you of the battery is it’s effectiveness. Most car owners use 2 separate batteries: one for electronic devices and the other for normal car use. With the XS Power D3400, you don’t need a second battery since its power is enough to power everything. And its durable design and average size casing ensure that you use the battery ion cold or bad weather. What is more, the battery is vibration resistant, no frets for bumps or rough driving. With low resistance comes to a continuous power supply no matter where you are – always dependable. Might not last long in situations of heavy use. 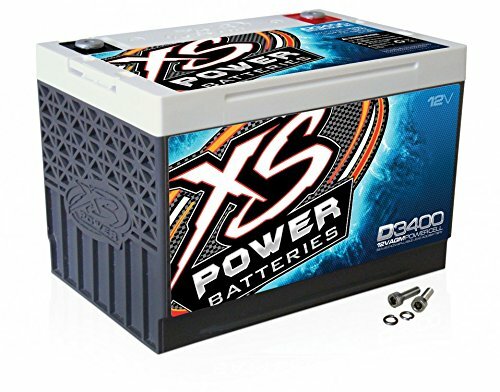 XS Power D3400 XS Series 12V 3,300 Amp AGM High Output Battery with M6 Terminal Bolt is used to power electronics in cars. You can use Optima Batteries 8002-002 34 RedTop Starting Battery to start vehicles in cold weather. The Optima 34 RedTop delivers superb cranking power even when the weather is harsh. Truly, it is a heavy duty use battery thanks to its high starting ability, leak-proof design, and high power. This battery is able to withstand hard launches and extreme corners, making perfect for all types of roads. The battery provides longer life. Comes at a great price and high quality. In fact, I would say it’s the ultimate auto battery, heavy truck battery, and a battery for all other application. Another thing that I found very useful with this battery is the ability to resist common failures. So, you can always count on this battery to get the job done whenever you want. And it is one of the few batteries that offer precision control due to the spiral-cell tech. 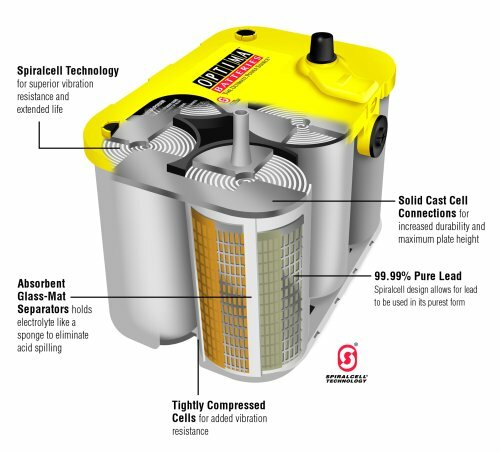 This technology offers a series of spiral placed cells with 2 pure lead plates covered in the lead oxide. Thus, you can always depend on the 34 RedTop for power around the clock. We all love batteries that tolerate temperature and humidity, don’t we? While you can rest assured of getting these great features in this battery and is always monitored. Easy to connect to the car. Not ideal for high electric uses. 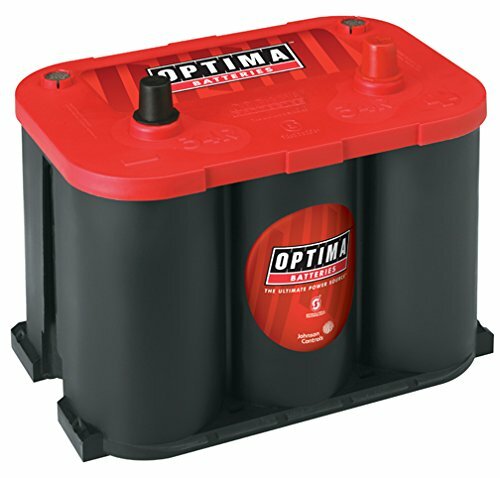 Optima Batteries 8002-002 34 RedTop Starting Battery is used to start vehicles in cold weather. 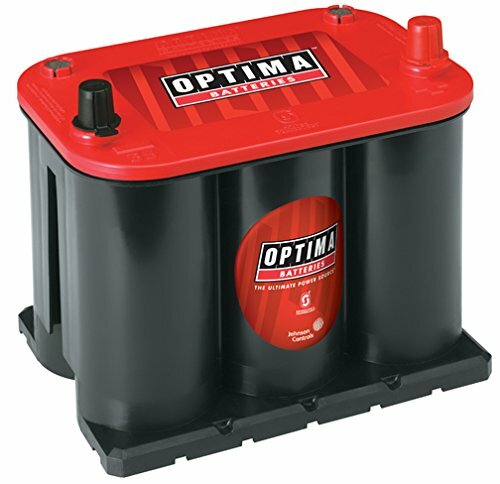 The Optima Batteries 8022-091 75/25 RedTop Starting Battery is ideal to start and run vehicles. If you love Optima Batteries products you know that they deliver power under harsh weather. This still applies to the 75/25 RedTop. In fact, you can use it in both cold and hot climates to start your automobile with no issues. Gives a warning when about to die. Perfect for both cold and hot weather. While the battery runs well in the heavy use of vehicles such as off-roaders and hot rods. Also, I love the fact that it is 100% leak-free battery which provides a great starting ability. But you might be wondering why all this power comes from. That’s possible due to the spiral-cell design that offers a clean and strong power source, guaranteeing your safety. I also found this 12v car battery to be amazing because of the high reserve capacity it provides. Consequently, you will get the juice you require even when the battery seems to be running dead. And things can only get better since the battery outlast all acid batteries on the shelves today. If everything goes as planned, this battery is likely to last for years. Often break down before its useful life warranty is over. Optima Batteries 8022-091 75/25 Battery is used to start and run vehicles. 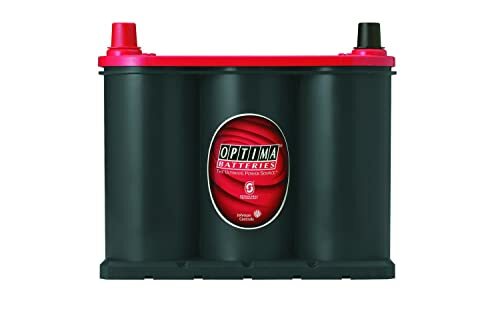 The Optima Batteries 8020-164 35 RedTop is the best 12v car battery for old engines that are hard to start. It is that’s powerful when it comes to ignition of your car all the time. All its power comes from the spiral-cell tech which is simply a spiral wound cell that is comprised of 99% lead plates. The Optima Batteries OPT8020-164 battery, which is built for every road use, can work well at the ultra-low temperature. I love the fact that it comes with a negative coated lead plate and a positive coated one. Hence, you cannot confuse which plate goes where or even lead to a short circuit. When you think everything has been said, you realize that the battery provides a reliable cranking power. Precisely, it serves the most challenging cranking ignition applications to ensure you don’t get stuck. This applies even when there is cold weather. And it’s 90 minutes reserve capacity comes in handy to assure of continued operation even when the battery is dead. Besides, I can confidently state that the battery is 15x more vibration-resistance, making it a durable 12 volt car battery. And it not only outperforms but also outlasts most traditional batteries. Easy to identify the positive and negative terminals. Might take a while to install. Its performance cannot match the price. 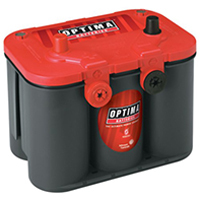 Optima Batteries 8020-164 35 RedTop Starting Battery is used to start cars with old engines. 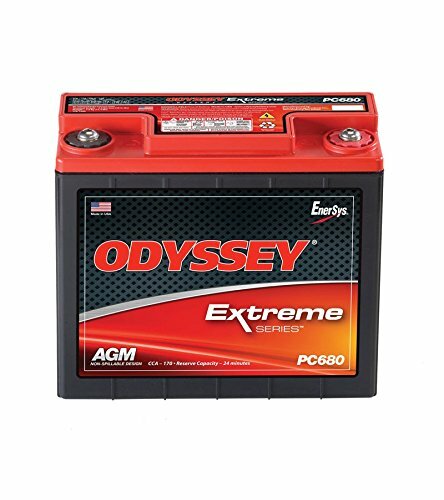 You can use Odyssey PC925 Automotive and LTV Battery to run cars that draw a lot of power. I love batteries that are resistant to vibration and durable, and this is all Odyssey PC925 is about. In addition, the battery has a long life of at least four years. This means that you can buy your battery today, install it, and forget about it for the next four years. Perfect for use on rough roads. A great choice for cold weather. Although its capacity is rated at only 28 Amps, which isn’t the best for a 12v battery, it still provides sufficient power for your car. Furthermore, the battery has little issues powering your car during the rainy or cold days. Moreover, it takes only 4 hours to get its juice back to the full capacity. But the best feature of Odyssey PC925 is the tightly sealed design. What this means is that your battery won’t leak regardless of how you install it or where you drive on. So, you get the freedom to mount it in any position and still enjoy effective service. And one more thing, although not a feature, the battery comes with a 4 years replacement warranty. Where can you really get a replacement when your battery dies before four years? Price is a bit costly. Not ideal for on-demand electric gadgets. 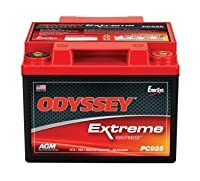 Odyssey PC925 Automotive and LTV Battery is used to run cars that draw a lot of power. Like the RedTop sisters from Optima Batteries, the D35 YellowTop is also a powerful 12v car battery. It offers tremendous durability when you compare it to other customary batteries. Additionally, like the RedTop series, the battery can be mounted in different positions and not leak even a single drop of acid. Lasts 3x longer than most batteries. Also, it features 15x greater vibration-resistance than most batteries on the market today. Actually, when you combine the resistance and the seal, you get a battery that you can take to any road. So, whether you have a car, SUV, or truck, you can use this battery to provide the ignition power you want. What that means is that the D35 YelloTop is able to withstand deep discharge and still recover within a short time. You might be tempted to think that it will die faster than most batteries due to the ability to offer deep discharge. On the contrary, it outlasts most batteries by three years. Thus, if you are looking for a durable, versatile, and safe battery, the D35 YelloTop might be what you need. A bit hard to install. 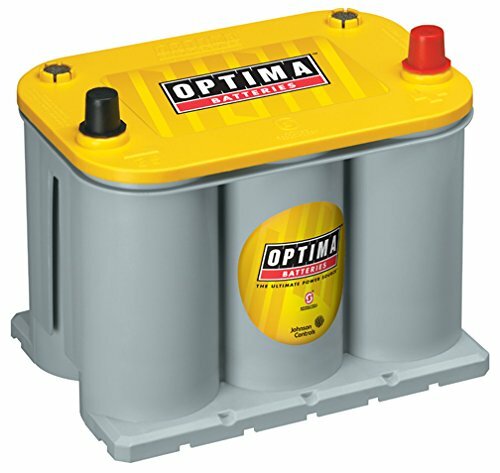 Optima Batteries 8040-218 D35 YellowTop Dual Purpose Battery is used to run all types of cars. 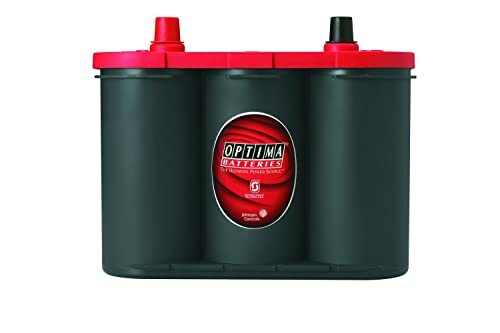 You can use Optima Batteries 8003-151 34R RedTop Starting Battery to start and run cars even in cold climate. A good number of Optima Batteries were designed to provide power even in harsh weather. The same principle applies to the 34R RedTop starting battery. But this specific battery has an edge over others since you can use it for off-roaders and hot rods. Easy to install in a car. Maintains a decent charge even after years of use. Another great feature of this battery is the leak-proof design which prevents the liquid from spilling around. It does all this while providing the ultimate power to run your car throughout the year. And thanks to the 100% sealed construction; the battery is safe for both the environment and your family. I also love its longer shelf-life due to its huge reserve capacity that gives out power all the time. My friend bought this battery a couple of years ago and from what I have seen, it still maintains a charge of about 10.5 volts today. It might not be sufficient for some uses but that a decent charge after having been an operation for 5 years. Breaks easily when it falls. Might leak if it takes a lot of beating. Not the most powerful battery out there. 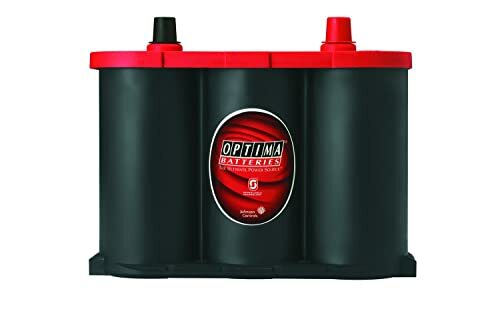 Optima Batteries 8003-151 34R RedTop Starting Battery is used to start and run cars in cold climate. The battery is able to take a lot of beating, making it perfect for all road users. Moreover, it is a non-spill battery that comes at a great price. Lastly, it provides more power than most batteries out there. For burst up power within 5 minutes, this is the best car battery. It is also able to resist heavy vibration and is completely sealed. Also, it provides the best output in its class. The reason for placing this battery as one of the best is its power. It is also quite durable and it’s 15x more resistance to vibration. Do you know how to use your 12v car battery? While, after you remove the old battery, position your new battery in the right place. The red terminal should match with the red cable of your car. Insert the cables to the respective terminals and then secure them. You can also apply a thin layer of grease to prevent corrosion. Now you can use your car battery. Q: How much does a car battery cost? A: Their price ranges from $75 to over $1500. Cost goes hand-in-hand with the cranking power. Q: Can my car battery change another car battery by itself? A: Car batteries don’t have enough power to change other batteries by themselves. You need at least 13.5v to change another battery. Q: How long does it take to recharge a car battery? A: This will depend on the battery. Some take 4 hours, other takes 6 others, while others take more hours. The best 12 volt car battery should have enough power to run your car. Ensure that you choose the right battery for your car and always take care of it.